A choice of walks allow you to enjoy a taste of the MILLENNIUM WAY, and the delights of the Worcestershire countryside. 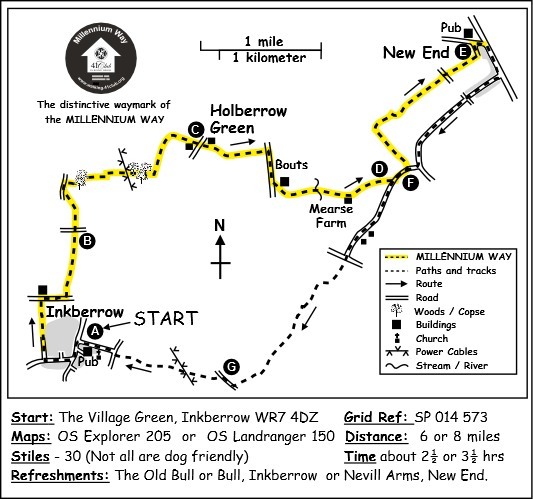 Both circular walks start from the village green in the delightful village of Inkberrow. A few yards from the start you will begin to follow an attractive section of the Millennium Way, where you will be guided by the distinctive green Millennium Way waymarkers.Find out more about the walk by clicking on the information icon. From the village green turn left down the main A422 road past Lilac Cottage on your right, then turning right into Stonepit Lane, continuing gently uphill past Greens Croft Way and after approx 200 yards turn right into a public footpath immediately after house number 22. Keep ahead with hedge left and houses right, eventually crossing a stile where you will see a Millennium Way waymarker. Go with hedge left for 70 paces, then on reaching a waypost left go some 20 paces right to hedge end where there is another waypost. At this junction of paths continue ahead keeping hedge left to reach the road via a metal kissing gate. Turn right at road for some 250 paces to find footpath left just before house, follow path between hedges into sports field and go with hedge left to find corner stile. Cross stile and go with hedge left for some 40 paces to find mid fence stile. Take stile and go ahead with hedge right through two fields and take gate to the road. Go through gate/gated gap to cross road, then continue with hedge left. At a bend in field take stile in corner. Head diagonally down field, passing small stable far left, to bottom corner taking the hidden stile, a few yards left of solitary tree, to road. Go right 10 paces then take stile right and go directly up steep slope to the top where you will find a further stile. Take stile and stay around field edge with hedge left to then take first gate left, then go immediately right following with hedge right to find further gate in corner of field. Take gate then ahead to corner to go right 20 yds to take metal kissing gate left into small thicket with pond left. (Take care with any electrified fences in this section). Make way through to tree plantation, passing under power lines, to exit by 3 bar fence stile to field. Turn left then cross field to right of large tree to stile. Cross stile to go with hedge right to gated bridge in corner of field. Cross bridge and go half right to cross a further double gated bridge by telegraph pole. Go with hedge right to find corner gate immediately beside a cottage with thatched roof. Take gate and follow driveway to road. Cross the road, over stile to right of private driveway into cottage yard then field. Go with hedge right to cross stile, then across a second field. At the end of the second field you will reach corner thicket with hidden gate. Take gate, then ahead through plantation keeping hedge right to find and take metal gate on right to emerge into small field and follow under power lines with hedge right eventually emerging onto road. Turn right at road, continuing past Middle Bouts Farm ( ignore first footpath left ) until you reach Big Bouts Farm where you will take farm drive left and follow track round right, then through gate. Ignore next gate immediately on right and follow the track, keeping hedge right, until you come to another gate. Ignore this next gate ahead of you and instead veer left in front of gate, following green waymarker to continue with hedge right to another gate at end of track. Go through gate, over stream and straight over two fields to cross footbridge over ditch. Follow left around garden/paddock between hedge and wire fence, noting attractive pond and jetty right. Take stile ahead and next stile walking beside garden to take stile left of Mearse Farm then ahead some 10 paces to take stile left. Go right with hedge right to take corner fence stile then going half left to cross a mid fence stile, turning right through coppice to the road. For the shorter walk we leave the Millennium Way here and turn right down the lane following directions from point F below. To continue the longer walk turn left up the road for 200 paces taking unmarked wide gap left and following the right hand footpath continuing with hedge right. Approximately 100m before field corner take gate right through gap in hedge and go left continuing with hedge left. Continue ahead through gap in corner then onwards keeping hedge right to metal gate. Go ahead with hedge right to reach road. Cross road then over stile into next field. Continue with hedge right through several fields and over stiles following the green Millennium Way waymarkers and maintaining line ahead over doubled gated bridge. Stay ahead, with hedge right, to cross two further stiles eventually reaching a small gate leading to passageway to road. Turn left past houses for about 100 paces to come to road, then turn right to reach the main road with Nevill Arms at the corner. (Stop here for refreshment if you wish). Here we leave the Millennium Way and turn right down the main road ( A441 ). When you reach Wood Lane turn right and continue along the lane to the crossroads then ahead into Mearse Lane. At T- junction follow lane round to the right ignoring footpath on your right which you took earlier. Continue along surfaced lane past Little Mearse Farm until you reach the main road. Cross the main road and take the track up towards the metal gate. Go through gate and continue ahead along grassy track. Where the surfaced area of the track veers right continue straight on along the grassy track between two tall hedges and caravan park on your right. Continue ahead and downhill along field edge keeping hedge left. At the corner of field go through gap and continue along narrow path with hedge left and fence right, eventually emerging into a large field. Continue ahead along edge of large field with hedge left. Follow the public bridleway marker along track between hedges for about 100yds to find marked stile ( easily missed ) on your right. Take stile and go diagonally half left across field to pass through wide hedge gap and go under power lines to exit by stile to surfaced lane. On reaching the surfaced lane turn right and take the first stile on the left signposted Inkberrow. Continue over stile and half right across field, walking gently uphill keeping well to right of pylon near corner of field to find a double stile. Take double stile and cross small field to pass under power lines and take a second double stile into next field. Stay ahead on a rising path to top of hill where you will have your first view of Inkberrow Church. From here we descend gently towards metal gate and stile taking a rising track up towards the church. Descending towards the lane cross over and through metal gate signposted to Pepper Street. Cross footbridge over small stream then onwards through metal gate in corner of field. 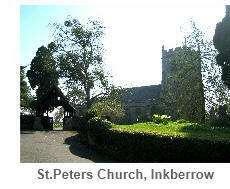 Here you can enjoy a lovely view of Inkberrow church high above you on your left. Go over stile by metal gate and continue up a rising lane back into Inkberrow, perhaps visiting the attractive church before you enter the village for some well deserved refreshment. Archers fans will recognise the half timbered black and white Old Bull near the village green as the well known fictional Ambridge pub. It is said that William Shakespeare stayed here whilst on his way to Worcester to collect his marriage certificate. The earliest recorded version of the village is Intanbeorgan, from the 8th and 9th century. Charles I passed through the village on his way from Worcester , leaving his maps behind in the Vicarage. The landscape in this area is dotted with black and white timber-framed houses from the 16th and 17th C, many of them listed. Although not all on the direct route of the walk, the following may be of interest to the architectural historian. All are nearby. MEARSE FARM - Farmhouse. C18; possibly as enlargement of an earlier house. SHURNOCK COURT is a half-timbered black and white building started in 1300 as a hunting residence in Feckenham Forest. MORTON HALL is an impressive brick building dating from 1780. MORTON HALL FARM the original manor house, and considerably older. The rear half of the house being dated between 1400 and 1500. 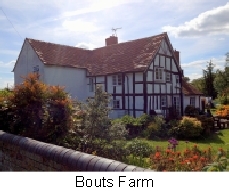 BOUTS FARM - Farmhouse. c1600 (illustrated). Approaching the village, some stonework can be seen in a wood. This may be the remains of Inkberrow Castle, demolished in the 1200’s. The Millennium Green at the foot of Church Hill is well worth a visit. Established to mark the Millennium Year, it is managed by Trustees as a natural open space for the refreshment and pleasure of all Inkberrow residents and visitors. It is a tranquil oasis containing interesting flora and fauna, ponds and a restored medieval moat from a demolished manor house. Dating from the 13th century, the church is the largest in the district, suggesting that even long ago it was the most populous settlement. The Savage family chapel is of interest. The pub contains several items of Archers memorabilia, following visits by members of the cast.